Euskadi-Murias fighting for wildcard slot on the Tour after elevation to Professional Continental level. The distinctive Basque flag — called the ikurriña — synonymous with cycling in the Basque Country could be flying again in the Tour de France. Efforts to revive elite men’s cycling in Spain’s Basque Country are edging closer to a Tour return. Euskadi-Murias, the heir to the Basque cycling heritage, is officially back on the Tour radar. 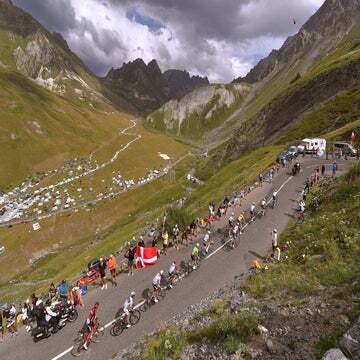 ASO, owners of the Tour de France, has formally opened its calendar to the Professional Continental team for 2019 racing season. That means the team will be in the running for wildcard invitations to such races as Paris-Nice and the Critérium du Dauphiné and perhaps even the Tour. Just getting to the Tour’s pre-selection long list is a milestone not only for Euskadi-Murias, which first hit the Continental ranks in 2015, but for cycling in the Basque Country as well. The team is part of a revival of elite men’s racing in one of Europe’s hotbeds. Spain’s Basque Country has delivered some of cycling’s top names over the decades and hit a peak with the Euskaltel-Euskadi team in the late 1990s and 2000s. The homegrown Basque team was created in 1994 as a way to promote cycling and hit a high-water mark when the team, racing with its trademark orange jersey of title sponsor Euskaltel, raced in several editions of the Tour. The Tour climbs, especially in the Pyrénées, would be awash with rowdy fans waving orange jerseys and the distinctive ikurriña flag. The team folded in 2013 after losing key private and institutional backing in the wake of Spain’s economic crisis as well as with doping scandals. Cycling in the Basque Country suffered for several years as groups searched in vain for money to revive a professional team. Euskadi-Murias has been slowly rebuilding the Basque cycling tradition from the ground up, and bumped to the Professional Continental league in 2018. The team delivered eight wins in the year, including an emotional stage victory at La Camperona during the Vuelta a España with Óscar Rodríguez in what was the team’s grand tour debut. 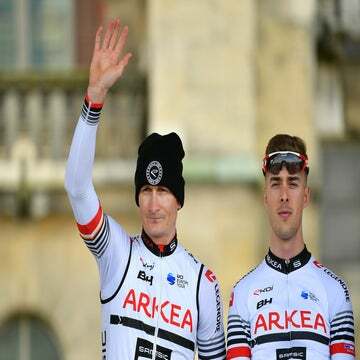 The team is hoping to build on that momentum going into 2019, with one eye on earning a Tour de France wildcard berth. To boost its Tour chances, the team has tapped the services of consultant Francis Lafargue, a French veteran of the cycling world who was long associated with Banesto. Lafargue joined Odrioloza at the 2019 Tour presentation last month in Paris and later huddled with ASO officials, including Tour director Christian Prudhomme and ASO president Jean-Etienne Amaury. What are the team’s chances for a Tour bid in 2019? Even they admit it won’t be easy. Of the four slots available to wildcards, one is all but assured to go to Cofidis. With the Tour starting in Belgium next year, it’s likely another one could go to a Belgian team. And then there are three French teams — Direct Energie, Fortuneo-Samsic and Vital Concept — also desperate for a chance to race the Tour. Another team hoping for a shot at the Tour includes Israel Cycling Academy. For 2019, the team loses one of its top performers in Eduard Prades, who won the Tour of Turkey and the Tour of Norway with second at the Tour of Yorkshire, to Movistar. While additions include Beñat Intxausti, who has suffered with health issues in three years with Team Sky, the team has not signed a marquee name for 2019. The 20 riders for 2019 will hit a training camp in January and make its season debut at the Mallorca Challenge. It will be interesting to see if the mystique of Basque cycling can earn Euskadi-Murias a spot in the Tour this season. Wildcard invitations could be released as soon as January.